Some important anniversaries mark this exceptional year for Poland: the twenty-fifth anniversary of gaining freedom, the fifteenth anniversary of NATO membership, and the tenth anniversary of EU membership. Each important anniversary is a time to stop and reflect on what of significance is happening around us, in Polonia, Canada and Poland. 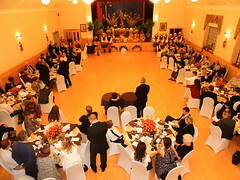 This was the case during the most recent dinner of the Polish-Canadian Business and Professional Association of Windsor on November 7 in Windsor, with the participation of the Polish Ambassador to Canada, Marcin Bosacki, and his wife, Katarzyna. During a special VIP reception, arriving dinner participants, not only from Windsor, but also from Toronto, London, Chatham and Detroit, could together to get to know and at the same time admire the beautiful exhibition, “John Paul II, Poland’s Gift to the World”. The exhibition had just returned from Vancouver after a tour of Canada and the U.S.A. lasting several months. Before the start of the official programme, there was a brief meeting of the young people with the Ambassador. In the future, they will be the driving force of Polonia. For this reason, nurturing them is one of the most important tasks of our community. 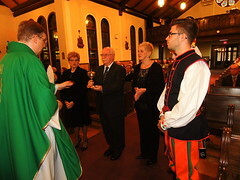 President Jerzy Barycki, a collaborator in many of the successes of Polonia in Windsor and Canada, officially greeted close to one hundred participants at the annual gathering. He emphasized the contribution of Polonia over many years to the enhancement of the Windsor community and as a result, of Canada. A moment later, the beautifully rendered national anthems of Canada, the U.S.A. and Poland took those present into a solemn, international frame of mind. 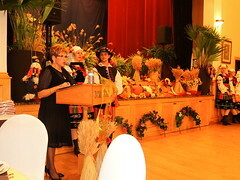 Several individuals well-known to Polonia offered traditional greetings: the federal MP for Windsor-Tecumseh and Deputy Speaker of the House of Commons, Joe Comartin, and the MPP for Windsor-Tecumseh, Percy Hatfield. The City of Windsor was represented by Councillor Drew Dilkens, who the previous month had been elected the new Mayor of our city. Joe Comartin, who is coming to the end of his political career, commented very positively on the collaboration with our Polonia as one of his best ethnic interactions. He added that the accomplishments of our Polonia are rated very highly outside of Windsor, on a national level and in terms of cooperation with Poland. Paul Borrelli and Irek Kusmierczyk were among the several city councillors present. Irek Kusmierczyk, a re-elected councillor of Polish heritage, thanked Polonia for its support in the elections. Mariusz Szajnert, President of the Polish American Congress, Michigan Division, presented sincere greetings from Polonia in the State of Michigan, emphasizing the activation of contacts between us. 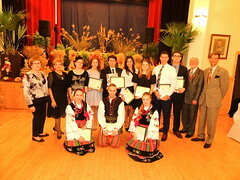 More pictures and details are available on the official web site of the Polish Embassy in Ottawa under the following link. 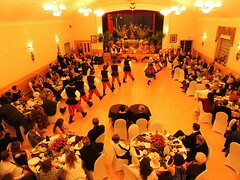 VIP table, from the left, seated: M. Szajnert, K. Bosacka, J.& M Comartin, From the left, standing: A. Chomentowski, Msgr. P. Sanczenko, B. Lemecha, J. Barycki, M. Bosacki and J. Ouellette. Photo – Maria Kulesza. According to the global ranking of the World Prosperity Index, Poland is at the 31st place in the world listing for the prosperity of nations. Ambassador Marcin Bosacki, the Keynote Speaker of the evening, in an interesting way presented the 25-year history of free Poland as the road from one of the poorest countries in Europe to a major, economic and political success. This achievement positions Poland not only for cooperation with the nations of Europe, but far away from them, also with Canada, where Polish companies, such as KGHM, are significant investors. The negotiated economic agreement between the EU and Canada awaits final acceptance by the member nations of the Union. It opens up a new, enormous market of cooperation as partners for Canada and Poland, today and tomorrow. This year’s visits to Poland by the Minister of Foreign Affairs, later by the Prime Minister, and last month by the Governor General, reflect the strengthening of cooperation between our nations. An interesting presentation on the biggest commercial event of Polonia in the world, the Polish Festival at Roncesvalles in Toronto, was given by its joint organizer of many years, Director Andrew Chomentowski. This year, about 400,000 people participated in the Festival. This is an indication of the great interest by the citizens of multicultural Canada, not only in Polish cuisine, but also in the culture and tradition of our nation. The last and extremely interesting presentation was a ten-minute film of interviews with participants, advisors, diplomats and organizers of the Conference of Young Polonia Leaders, Quo Vadis. Ania Barycka provided a brief summary of the Quo Vadis conferences. This important work explains why our youth of Polonia puts so much effort into the organization of these meetings, what tangible benefits result from them, and what provides the motivation to participate in them in Canada, the U.S.A. and Australia. 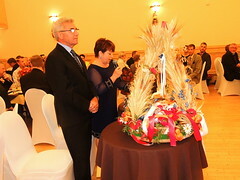 An important celebration was the decoration of Mr. Józef Palimaka with the Gold Cross of Merit of the Republic of Poland. He is a volunteer with the Windsor-Chatham Branch of the Canadian Polish Congress, a member of our Board of Directors, and a veteran of the Second World War, a mechanic serving with the legendary No. 303 Squadron of the Royal Air Force. The programme was co-ordinated in a professional and punctual manner by Dr. Frank Simpson, who knows the Polish language very well and helps Polonia with the translation of numerous documents. His closing comments included high praise for the evening’s speakers. He also cited an article in the magazine, The Economist, which was appreciative of Krzysztof Zuk, the Mayor of Lublin, Windsor’s twin city in Poland, and the development strategy of that city for the years.2013-2020. As always, the tasty food from the Dom Polski kitchen and good wine from the Aleksander Estate Winery, the owners of which are of Polish heritage, superbly complemented the evening. By way of conclusion, the sponsors, the excellent multimedia, the media and the organizers were recognized and thanked. 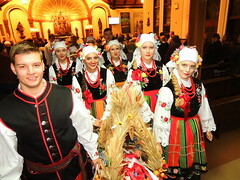 Next, Windsor’s “Tatry”, one of the best song and dance groups of Polonia, performed a selection of dances. 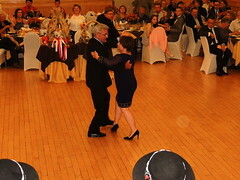 The youth, energy and superb dancing skills, shown in the Polonaise, the Mazur and the concluding Warszawska Polka, were rewarded with bravos many times over. 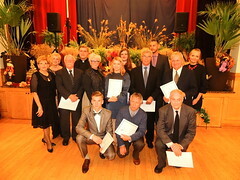 A group photograph with the ensemble and contributors to this unforgettable evening marked yet another success in the history of Polonia Windsor. Because this was Ambassador Bosacki’s first visit to Windsor, additional meetings were held, but they are not covered in this report. The Ambassador met with the Mayor-Elect, Drew Dilkens – who expressed appreciation for the collaboration with Polonia – and with the management and administration of the impressive apartments of Polonia Park. The Ambassador also took part in a holy mass for the Homeland in the Holy Trinity Church, where in a speech he emphasized that the Windsor Polonia is among the best organized and most active in Canada.